The release of Weathersongs Volume One: Days In Wales has attracted a flurry of attention from media in Wales. In the first week since release, Richard has been interviewed on ITV, BBC Wales and Radio Ceredigion. Wales in Aberystwyth at 08:50 and then coming back home to be filmed for ITV’s Wales Tonight (seen here with ITV’s Rob Shelley). This was followed by a photo for the Cambrian News and, on Wednesday night, an hour chatting and playing some tracks from the album with Steve Edge on Radio Ceredigion. A half-page article and photo came out in the Cambrian News on Thursday. Following this, the first international airplays came in with album tracks being played on Silent Running (Radio ARA, Luxembourg) and RTQE (WORT Madison, WI USA). Online, the project has featured in Rhizome News and elsewhere. 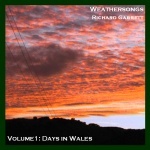 The first CD album of music from Richard’s Weathersongs Project, entitled Weathersongs Volume 1: Days in Wales, was released on March 28th 2006. Days in Wales is an album of 14 short pieces of music derived, in real time, from the weather conditions in Southern Snowdonia on 14 different days over one year. 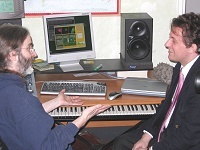 Each track was electronically generated by a computer program connected to an electronic weather station at Richard’s home in the foothills of Cadair Idris, North Wales. Selected output from this installation, was then edited and recorded to make the CD. The music ranges from the gentle ambient electronica of a cool spring morning to wild, almost Free Jazz, saxophone as the westerly gales of autumn hit Cardigan Bay. Richard’s latest project, Weathersongs, is now up and running. Weathersongs is a project to compose music from the ever-changing patterns of the weather. The project has a number of elements ranging from a real-time installation through to musical interpretations of data and collected over days or even months. The first phase of the Weathersongs Project is an installation which uses an electronic weather station to compose continually evolving music in response to surrounding weather conditions. 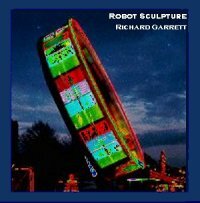 The first version of this installation has already been built and is located at Richard’s home in North Wales. The second phase edits the real-time output of the installation to form shorter, more structured pieces, that reflect the weather at particular place and time. In time, Sunday Dance plans to release collections of pieces, each collection from a specific location, as audio CDs. Extracts of music produced by these first two phases can be heard at the weathersongs website. The next stage will utilise a data logger to record changes in the weather over set time periods (say, single days); sonify the information; and play back the resulting music over a shorter time (probably one day = six minutes). Collections of these "Days In the Life" will also be made into CDs. The software for this element is currently under development. NOTE: weathersongs.org is no longer running. Details of the project can be found here.